Luscious brown colour with vanilla, coconut and toffee aroma on the nose. Flavour is a perfect blend of brewers and whiskey malt with a smooth, creamy finish. Lovibonds Dark Reserve is a barrel aged Porter 11.7% abv. We took our popular Henley Dark recipe and made it a little bit stronger. 2 mashes and 24 hours later we produced and amazingly rich and flavourful wort. After fermentation we patiently aged this beer in our Henley cellars in fleshly dumped Makers Mark Bourbon barrels for 1 year. Each one of only 500 bottles are individually numbered and hand dipped in wax. 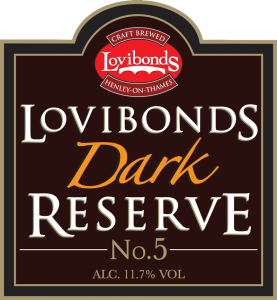 Lovibonds Dark Reserve No 5 is only available while supplies last. Enjoy on its own with some deep contemplation.